The engine room is one of the most important areas on any ship. It provides the power to move the ship through the water. For a basic introduction to the principles of the steam engine, see How stuff works - steam. The VIC 56 is comparatively late for a steam ship. By the time she was built in 1945, almost all new ships were diesel powered. However, the wartime ship-building program stretched diesel engine builders to the limit, while there was spare capacity among steam engine makers. This is a double expansion engine, built by Crabtree & Co. Ltd., Great Yarmouth. The HP (High pressure) cylinder has a piston valve, while the LP (Low pressure) cylinder has a slide valve. At the rear of the engine is the main water pump, which forces water into the boiler to replace that evaporated into steam. 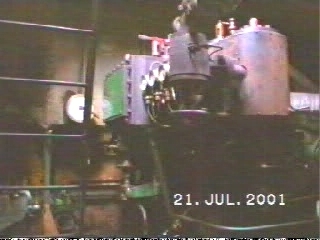 Having passed through the engine, the exhaust steam is cooled with sea water in the condenser, and condenses back to water. As water has a far smaller volume than the steam it has condensed from, a partial vacuum is formed, on the exhaust side of the LP cylinder, which increases the difference of pressures on each side of the piston, which cause it to move, so the power of the engine is increased. The water from the condenser is pumped back into the boiler, so a closed cycle is set up, so little extra water is required. This is a Cochran multi-firetube boiler. It has a dry smokebox. This means that the space the hot gasses exhaust into is outside the main boiler. 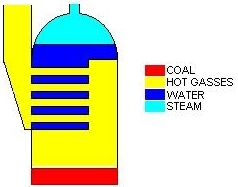 A diagram of the VIC 56 boiler. 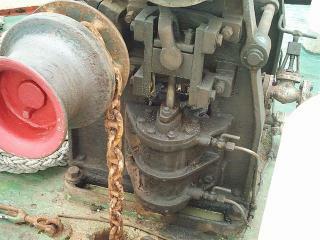 In addition to the main water pump connected to the main engine, there are two other water pumps. These are the Worthington general service pump and the Pearson banjo type pump. The anchor is raised and lowered with a steam windlass, shown below.